The combined medicinal effects of raw honey and lemon juice are cornerstones in traditional Spanish and Latin American cough and cold treatments. Researchers have found raw honey to be a natural antibiotic that accelerates healing by annihilating invading microorganisms. Lemon juice complements the work of honey through vitamin C, a natural immunity booster that assists in repairing damaged cells and tissues in the body. To harness the following health benefits, mix equal parts of raw honey and lemon juice. In an article published at Oprah.com, international chef Aine McAteer places honey and lemon juice on the list of beautifying ingredients for nourishing facial masks. According to McAteer, honey is a natural hydrator easily absorbed by the body and a perfect combatant to dry, mature or wrinkled skin. The nature of lemon juice renders opposite effects and should be used for oily skin in combination with honey as a natural moisturizer that removes excessive oils. According to the U.S. News and Health Report, recent medical research has placed honey on the list of treatments for skin ulcers that often sneak up on those suffering from diabetes. In an editorial published in 2008 in the journal “Advances in Skin & Wound Care,” Dr. Richard Salcido states that the belief in honey’s healing properties lies in its grand abilities of reducing edema, inflammation and scarring while promoting new tissue growth. As lemon juice is naturally brimming in vitamin C, adding the juice to healing poultices will accelerate healing. 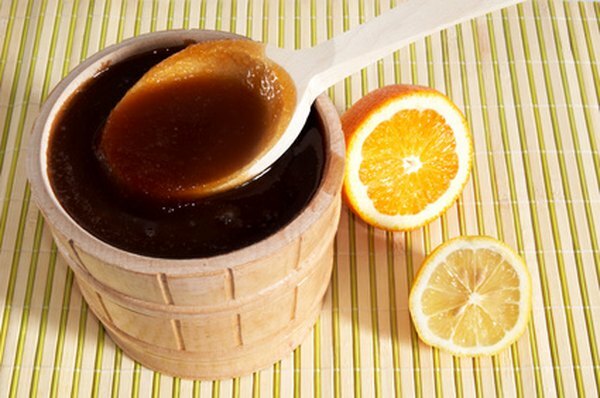 Honey and lemon are traditional components in cough and cold remedies throughout Spain and Latin American countries. A Spanish concoction of honey, lemon and garlic with boiled water is said to have ward off coughs and cold successfully for generations.